We manage to get the latest price details of Samsung Galaxy SII from Extra Store. I believe it is now a good time to buy Galaxy SII. 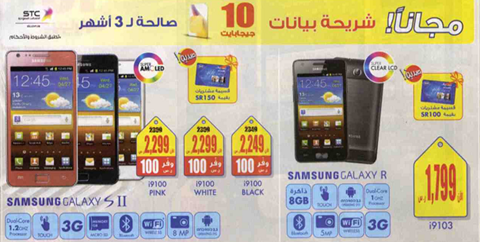 It is now being offered with free Samsung Galaxy Y upon purchase of Galaxy SII. Some reviews says that Galaxy SII is almost equal to iPhone 4s when it comes to picture quality. Galaxy Note will be the best choice if user like to have a phone a gadget that could easily be used to take notes. For picture purpose we could recommend the Samsung Galaxy SII but be informed that soon Galaxy SIII will also be available in the market. 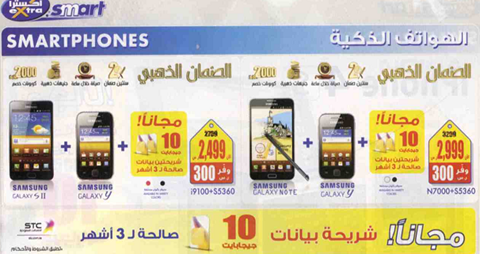 Samsung is really strong in Saudi Market and is a great competitor of iPhone.